Le Secret des Banquises (2016) - Sci-fi-central.com.  France / Belgium  2016  81m   Directed by: Marie Madinier. 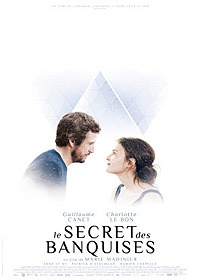  Starring: Charlotte Le Bon, Guillaume Canet, Anne Le Ny, Patrick d'Assumçao, Damien Chapelle, Xavier Beauvois, Eveline Lutz, Béatrice Bonnaudeau, Alain Buron, Alain Drouet, Méranh Karounna Gobert, Didier Leferd, Andréa Malvezzi.  Music by: Stephen Warbeck. Silently and hopelessly in love with brilliant and egotistical Professor Quignard, the shy Christophine has been pursuing her PhD at his research lab for eight years. Now, the professor and his team are on the verge of making a discovery that will rock the world of science and medicine: the key to universal immunity through 'ppm', a miracle penguin protein. I'm somewhat wordless because this "fresh" and "relaxing" romantic comedy drama sci fi movie pretty well sums it up, to borrow, in part, Preslav Penchev's description. There is a soft white coated softness to this movie. With a bio-medical sci fi element, this French-Belguim movie avoids much of the heightened anxious intensity of most sci fi movies and focuses more on the humor of the authentic moment, of humanity meeting science, and brings out the lusty craziness, the richness, the sadness, the longing, and the ultimate tenderness of romance and love. I'm not going to even try to compare this movie to any other movie as it seems to stand distinctively enough on its own. Review by tabuno from the Internet Movie Database.